Admin's Note: This is an archive article that has been moved over from our old site. Author and photographer credits are unknown. Originally published in 2002. Senior Deputies Tim Hagel and Frank Underlin are two Rescue 3 Swiftwater Rescue Technician (SRT) instructors within the Ventura County Sheriff's Department. Tim and Frank conduct SRT training on a regular basis for the VC SAR teams. Most of the training takes place locally, but occasionally the deputies take the training out of town to find more challenging conditions. Thanks to Tim and Frank, the teams have come a long way in developing their proficiency and confidence while handling the many swiftwater call-outs within Ventura County. 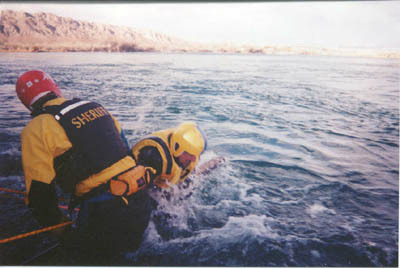 The strong current of the Colorado River in Laughlin Nevada, provided rescuers with an excellent training area, and at the same time, was a welcome break from the insanity of the Kern River, our other out-of-town training area. A dry run was done with the throw bag. After the second throw bag practice there wasn't enough time to repack the bag. After practicing on land a throw bag practice was done in water. Anyone who get past the first line gets picked up by the downstream safety. Jim Traverson demonstrated proper position for floating down a swift moving river. The current was measured at 8 mph on this day. Carlson boards give rescuers an advantage when going after a victim. 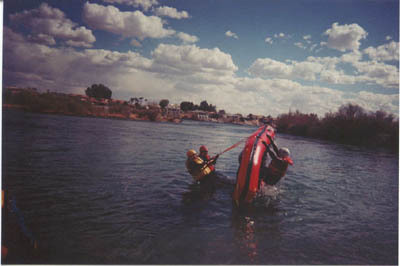 Rescuers use a ferry angle to travel efficiently in a current. 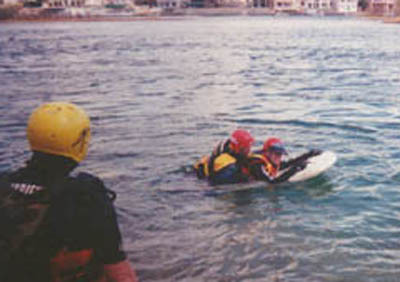 Personal watercraft equipped with rescue boards were used for safety during the training. Assisting tired participants went smoothly with the help of the PWCs. Frank Underlin demonstrated how to mount a victim on a Carlson board. Many of the swiftwater rescues/assists performed in Ventura County have involved using the inflatable boat. 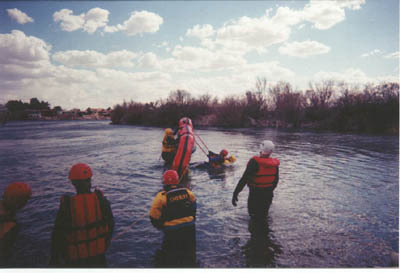 Often times rescuers are able to walk the craft through flooded areas to pick up stranded victims. In the event the water becomes too deep, the boats come equipped with paddles. 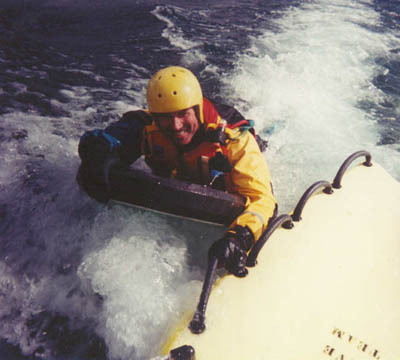 If an inflatable boat transporting rescuers is capsized, there is a technique can be employed to right the craft. Three man crossing technique can work well in shallow water with a current. 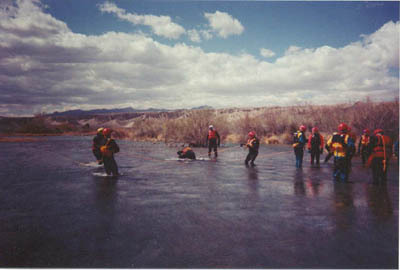 A second strategy for a shallow water crossing involves a group of people. The largest individual is placed at the front of the line, and others hold on behind the leader. 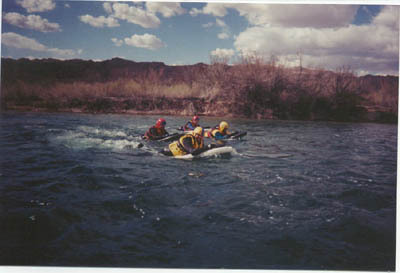 The weight of the person behind, pulling the person ahead downward allows the group to walk further along the riverbed than is possible alone. 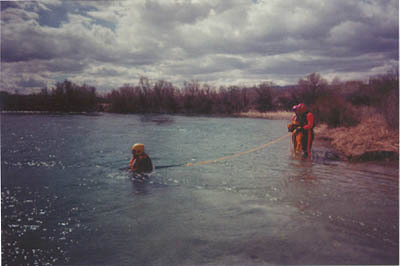 A strong swimmer was utilized to pull a line to the other side of the swift water river. Jay Fischer used the Ferry Angle swimming technique to reach the opposite bank. 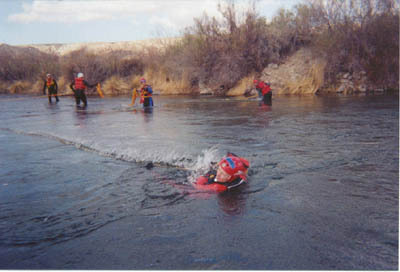 Upstream safety is extremely important for swiftwater rescue work. When ropes are used across a river, the potential danger to boaters is increased substantially. 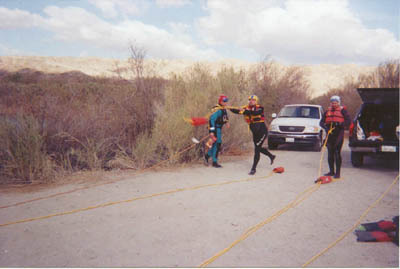 After the rope is secured to an anchor on the opposite bank, team members were able to cross the river effortlessly using the tensioned diagonal line system. The system can be easily modified for a smaller scale such as that used by John Sullivan. Use of personal watercraft helped speed up operations. As a last resort, rescuers may enter the water as "live bait" to save a victim. Proper equipment, timing and technique are essential to avoid hazardous consequences. Big Jim jumped in and performs a live bait save of three swimmers at once! Frank and Tim instructed the team on how to dislodge a victim caught up in a strainer using the single line method. An artificial strainer was carefully rigged to demonstrate the force exerted by the current. Once caught in the strainer, there is usually no way out. Jay made a valiant attempt to go over the top of the strainer.